The 218 was recently lettered. Thanks for the info and photo. Nice photo that Rainier Rails included, but it is about 18 months old. There has been lots of progress on that project since then. Here is a more current photo of the Northwest Railway Museum's coach 218 taken earlier this fall. Is this OWR&N observation car similar or quite a bit different? The #552/#1577/#1590 at Snoqualmie was built in 1913 by Pullman, and is listed on Don Strack's website as being built as observation #552. Built in 1912 by Pullman as OWRR&N café parlor observation #496, renumbered in 1915 to #1589, reconfigured in 1922 to business car #184, transferred in 1932 to OSL #157, renumbered in 1953 to #124, renumbered in 1965 to #125 (1st), retired and sold in 1966 to Stockton Terminal & Eastern RR, later to Golden Gate RR Museum, sold in 2002 to Ralph Domenici, moved in 2009 to the South Bay RHS-Edward Peterman Museum of Railroad History-Santa Clara SP Depot, donated in 2012 to the South Bay RHS. 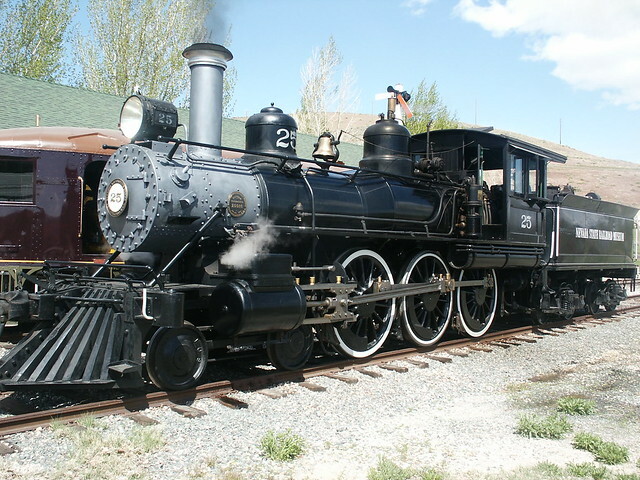 The Western Pacific 165 at WPRM Portola will be another restored locomotive running west of Colorado on it's home rails, albiet in yard limits. Stathi sure has his work cut out for him. I'm guessing these were very tired, worn out engines when retired after long careers. Blowing up the picture of the 4-6-0 and looking at the bottom of the smokebox and the condition of the tender frame, sure looks like there will be a lot of "new fabric" involved. Of course he did bring the "Chiggen" back to life, and it wasn't exactly a prime candidate for restoration either. If anyone can make it happen though, he's one I would place my money on. NP 924 actually was running in the early to mid 1970's on trackage at a cement plant in the Centralia/Chehlis WA area. Harold Borovec had her at that time and I got to fire and run her a few thousand feet in the snow over Xmas vacation while I was going to College. 924 was also hot and greeted the Freedom Train and 4449 as it passed through the area, I think in 1975. One of the videos I used to have showed the two as they met in passing. Here's a picture I shot of the ten-wheeler in 2010. 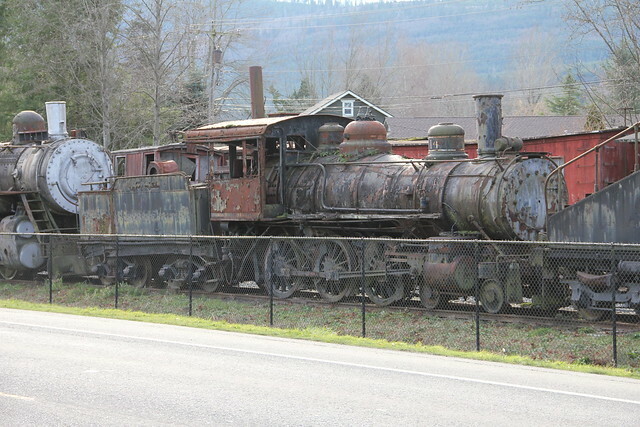 It's nice to see more 19th century steam restorations! wow, I'd never heard that before. Are there any pics of it running there at that time? What a pretty engine! It will nice to see her running again. The experience of firing up and running NP 924 was one of those special moments! We used wood and then coal to fire her up, taking most the day. I first arrived when she had just a bit of pressure, probably around 1 or 2 o'clock on a dark December day. By the time she was ready to roll, it was dark, so no pictures. Harold told all of us to stand back a goodly ways and watch. 924 was on a straight track that was level for maybe 100', then had a 4% or more grade for a couple hundred feet. He slowly chugged to the base of the grade, then really opened her up (knowing what would happen), WHAT A SHOW! All the partially burnt wood chunks flew out the stack and went 50-100' in the air like a giant 4th of July fountain! I should mention, there was a couple inches of snow on the ground, so no fire danger from the flaming fallout. There was quite a bit of trackage at his brother's cement plant, so we all got to run her and fire. This was my only experience shoveling coal into a firebox. I sure would enjoy seeing the old girl in operation again! When Stathi Pappas and crew are finished with #14 (above), I'm sure it will be a real show piece-- like this ten-wheeler at Nevada State RR Museum. The crew at the Northwest Railway Museum got the 924 to turn a wheel today, and moved her up to the Conservation and Restoration Center in Snoqualmie. They paused at the former Northern Pacific Snoqualmie Depot for this photo, and then continued on their journey. The project is underway!